U.S. bombing ISIS in Syria: How much does one airstrike cost? 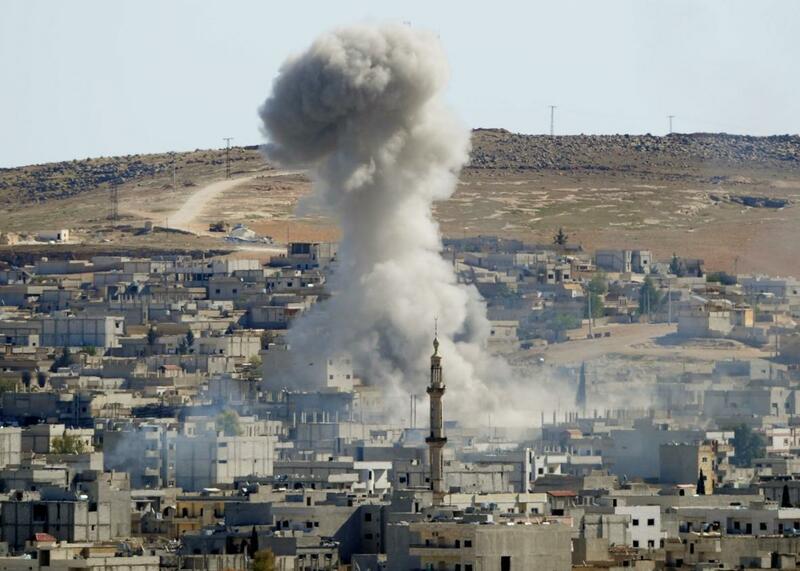 Smoke rises following an airstrike by the U.S.-led coalition in Kobani, Syria, on Oct. 21, 2014. There’s the kitchen-sink airstrike, with multiple strike packages rolling downtown under the cover of electronic jamming, anti-radiation missiles, and fighter support. Simultaneously, B-2s and F-22s come in like bolts of greasy smoke, and remote missile carriers are pooping out cases of death sticks that will hit from every point on the compass. Coordinated in time and space, these strikes are a smooth buildup to a spasming crescendo of violence. Then there’s the other side of the spectrum, with a couple bozos dropping a dumb bomb on some idiot climbing a hill with a rocket launcher. So, there’s a range. Pete Walinger’s cold, accurate, accountant’s approach is crisp and satisfying, especially with the final bill to four significant digits. Once you step away from the blast area, though, the costs become more nebulous. Do you add pilot training in the total? Space it out over every strike the pilot’s been on? Does the gas count? What about the cost of the ships or airfield? Can you factor in weapons development costs? What about the ordnance crew and their food? Their pensions? Should we even step into the swamp of opportunity costs? We can likely take a lot of these as sunk costs, aimed toward deterrence. This of course begs the question, “How much does one peace cost?” I guess we’d have to find one before being able to answer. What we shouldn’t talk about is costs in terms of human lives. While priceless in theory, governments and businesses have been summing it up for eons. Not very long ago, it was one horse. The Environmental Protection Agency hovers around $9 million, while the Department of Transportation is thinking $6 million. Those are American lives, most likely. Lives seem to cost less dependent upon distance from the office. Or perhaps killing saves money. If you only kill the right people, the ones blowing up our stuff, would losing one who makes the stuff balance that out? Right, right: philosopher’s hole. So let’s say we don’t scan the UPCs on the participants. What’s tougher to gather is the cost for the intel. The long pole in the intelligence tent is the exploitation. We are gathering so much from so many sources that it’s sometimes hard to put it all in context and glean every nuance. That doesn’t mean we have a surplus of really top-notch collection platforms, though. Satellite time and Global Hawk flight paths are hot commodities. Every time there’s a flare-up, resources are diverted from another flare-up, with potential costs. There is also actual overtime for some analysts. Of course, the Pentagon is tossing around operational costs all the time, so we should likely look to them to see how they come up with price tags. Most strikes are carried out by F-15s, F-16s, and F/A-18s, with the AV-8Bs, B-1s, and F-22s doing a little here and there. The strikers will carry three weapons and drop two. One important note is that this is considered “low-intensity operations.” Should things pick up, this number can start going north in a hurry. The logistics chain starts getting much thicker as the spears increase. It’s not a direct relationship, nor is there an economy of scale, as there is with so many commercial enterprises. Also, these strikes don’t include intense suppression of enemy air defenses. Fighters are self-escorting (meaning the strikers that can just carry a couple air-to-air missiles to look cool), jammers aren’t needed, and it’s a permissive environment. As long as they aren’t trolling in shoulder-launched surface-to-air missile altitudes, strikers can prance in and out at will. If you put in even a small integrated air defense system, with modern surface-to-air missiles and some fighters, this number is going to balloon. I hope this conveys the complicated mess Pentagon staffers have to wade through. And this is just a jot of what goes on there. The building has five corners because four wasn’t enough to cover all the people who want to curl up in one and cry. Military technology: Can an air-to-air missile shoot and destroy a plane if it has already landed? United States armed forces: Has President Obama, in fact, weakened the U.S. military?